US equity markets were mixed on Wednesday with the Dow Jones up 0.16% at 26,252, while the Nasdaq declined 0.61% to 7415. The S&P500 was fairly flat at 2837. US crude oil topped US$65 for the first time since 2014 during the session and gold hit its highest level since 2016 at US$1,355. Commodity price strength has been partly driven by the ongoing decline in the US dollar. The US dollar index hit a three-year low on Wednesday at just below 90. This came as Treasury secretary Steve Mnuchin stated a weak dollar is ‘good’ for US trade. 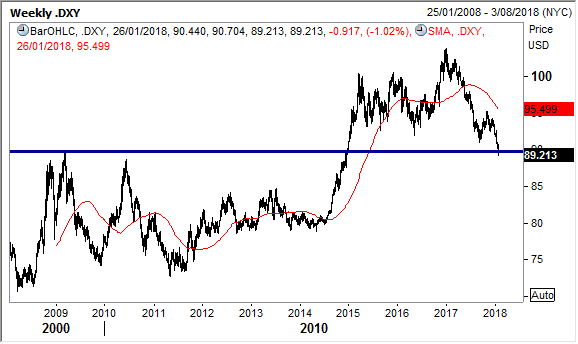 This is a break with the traditional strong dollar policy but Mr Mnuchin did state that strong US growth would support the dollar in the long-term. The euro hit it highest level versus the greenback since 2014, while US yields headed back towards three-year highs, with the 10-year yield rising as high as 2.66%. The comments from Steve Mnuchin are telling, and go to what I have been writing for some time, that the US administration will be very reluctant to allow undue strength in the US dollar. This desire has to be balanced with the fact that the US is one of the first (and certainly the most high profile) to move on raising interest rates. I think that under Jerome Powell we are going to see a very ‘measured’ pace of tightening continue. This is also what recent price action in the US dollar is telling us. 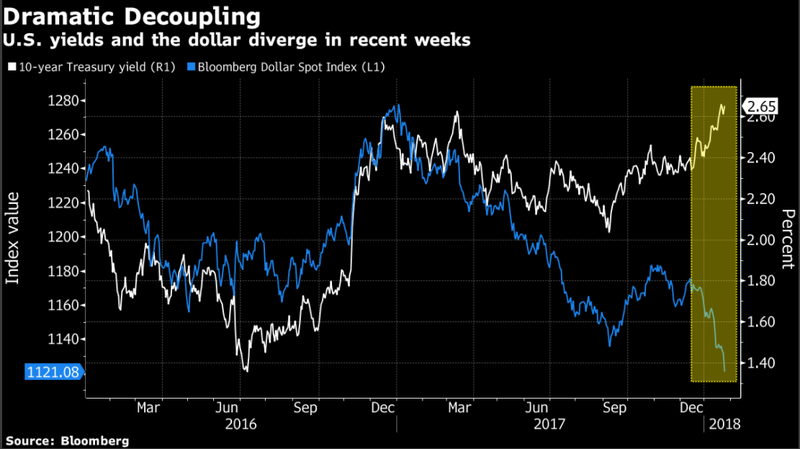 Although that said, the Trump’s administration preference for a weaker dollar is not exactly the best kept secret, in fact it is probably one of the worst. This has also been echoed by the actions and rhetoric of Fed officials for some time. The dollar index though has yet to materially break below 90. I still think we will see the US dollar firm this year, but we need to see a strong upward dynamic ensue over coming months to put the bearish scenario to rest. On the other side it is worth noting that longer dated bond yields have been moving out of step with the dollar. I made the point regularly in these notes last year that while the US (and other central banks) can control the short end, longer maturities are a completely different matter. This is starting to be acknowledged by the markets, and also that significant inflation following an unprecedented decade-long global easing program by central banks, is going to come home to roost. I have written in these notes on many occasions that bond yields (not just in the US, but globally) are going to break out this year and begin a secular bear market. I think this secular bear market in bonds has now started and we are going to see a much higher yield curve in the global bond market by the end of this year. 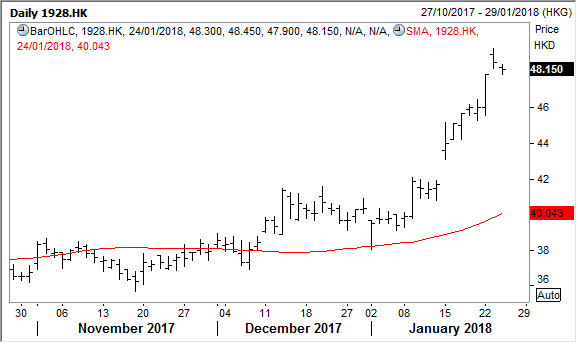 The bond market will not roll over easily without a fight, but the fact that 10 Year US T bond yields have climbed above 2.6%, is significant in that the resistance that was tested and probed this time last year is finally giving away. The four-decade long bond market bull is though as I noted recently, fattened and ready for the slaughter. Domain Holdings Australia also continued to rebound from Monday’s sharp fall, with a 3.7% rise. As I said the departure of Anthony Catalano has come as a shock but does not unravel the underlying investment fundamentals, and investors also seem to be concluding as such. 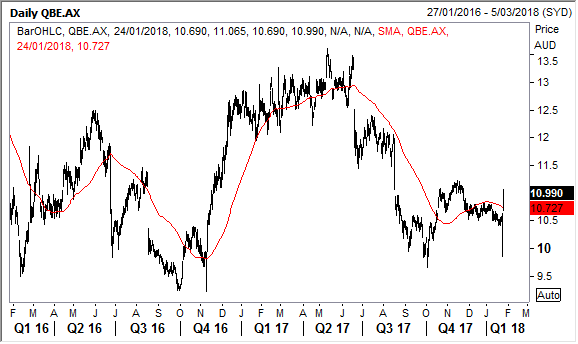 The star of the boards though was QBE Insurance, which chalked up a 5.4% rise to $10.99. This might seem at odds with yet another profit warning from the insurer, but as I outlined yesterday, comments from new Pat Regan suggest there could be some re-rating ‘events’ on the horizon. In addition, I think macro developments are set to be an increasing tailwind to earnings over the medium term. I wrote yesterday how the new broom was always going to impose his mark on the company’s turnaround strategy. Yes, there were some more write-downs (with Mr Regan rebasing earnings expectations) announced on Tuesday, but much of the financial pain, and many tough internal restructuring decisions, had already been undertaken while John Neal was at the helm. Major divestments though have not really been part of the agenda, and this is why I suggested yesterday that these could be in the thinking of Pat Regan. There was similar tone of view coming through from many institutional analysts yesterday, and this boosted investor sentiment. Macquarie has picked out five units which could be on the block; Australian Personal Lines; LMI, Argentina; Latin America (excluding Argentina); and Asia (excluding Hong Kong and Singapore). These divisions account for around 15% of annual gross written premiums and capital. They see divestments of these businesses as fetching around US$2.1 billion or around 14% of QBE’s market cap. I said that I expected a major divestment, but I am not sure that the CEO will be that ruthless near term. Certainly, Latin America will be under the microscope and could likely be in the mix for disposal as I noted. By the same token buyers will need to be found, and a fire sale will not be a path the company will want to go down. I therefore can’t see this all happening in one bite, although confirmation of one key disposal would likely see a further re-rating by investors. With the stock now around $11 I certainly see much more upside risk. This is not only because of the company specific catalysts, but thematic drivers on the medium-term horizon. I think rising inflation will be good for cyclical premium growth and is why management may be best to cut some businesses ‘more slack.’ Underwriting demand/profitability will also be boosted due to a reduction in supply (insured capacity) on the catastrophe side following 2017’s unprecedented sequence of natural disasters. As I have outlined, the other positive driver for the bottom line is that higher bond yields over time will continue to push up investment income. Shares in Sony were down 5.06% in yesterday’s trading with JP Morgan downgrading the company to neutral from overweight, citing slowing momentum for Apple’s iPhones as likely to weaken demand for Sony’s image sensors. Demand for high-end smartphones is starting to plateau, with iPhone X production expected to fall by 50% quarter on quarter and Sony receives half of all image sensor revenue from Apple. Sony is a leader in the production of image sensors used in smartphone cameras and has benefitted from a trend of including multiple image sensors in each phone. 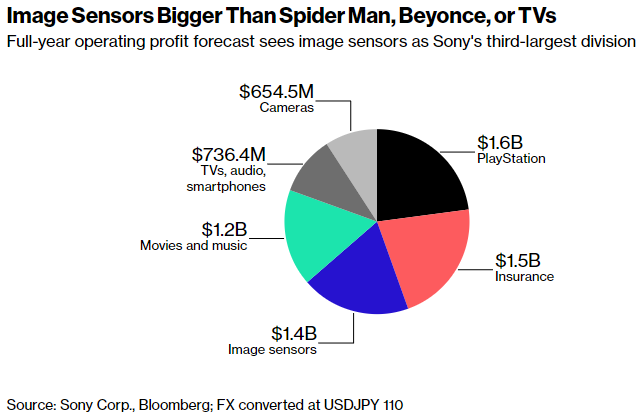 This is likely to put pressure on the share price, with image sensors the third largest contributor to operating profit, behind Playstation and Insurance. Sony continues though to execute well, and concerns over slowing iPhone demand are probably also overdone in our view. Sony is a top 10 holding in the Contrarian Fund, Global Opportunities and Asian Managed Account portfolios. The trading action in our Macau casino operator exposures was mixed. Wynn Macau managed to eke out a minor 0.7% gain following on from a 6% spike the day before after its parent Wynn Resorts reported fourth quarter numbers that showed a strong performance from the two Macau casinos operated by Wynn Macau. The strong performance of both stocks over the past week means has seen the shares of each more than double over the past year. Both Hong Kong-listed Wynn Macau and Nasdaq-listed Wynn Resorts are held in the Global Contrarian fund and the Global Opportunities Managed Account portfolios. Wynn Macau is also held in the Asian Managed Account portfolios and Wynn Resorts in the US Managed Account portfolios. Sands China shares dipped 0.8%, while MGM China shares gained 1.2%. The company’s new casino in the Cotai Strip is due to open at the end of January, which should see the company be able to snag some market share in the buzzing gaming district. Visitors are flocking to the area to see the many world-class attractions of the new casinos that have opened over the past two years. Both stocks are held in the Global Contrarian fund, the Global Opportunities and Asian Managed Account portfolios. S&P Global Market Intelligence has projected gross gaming revenue (GGR) growth in Macau of 6-12% in 2018. The firm estimated mass-market gaming revenue would increase by 5-10%, while VIP gaming revenue would likely be higher, but below a 15% pace. Combined this gets them to their overall 6-12% forecast. It is a relatively conservative forecast compared to some of the others floating around. Morgan Stanley reportedly increased their gaming revenue growth estimate for 2018 from 11% to 16% last week. In the last few hours Las Vegas Sands has also reported a robust recovery in Macau, with fourth quarter numbers ahead of estimates. Disclosure: The Fat Prophets Global Contrarian Fund declares a holding in: Domain Holdings, Wynn Macau, Sands China, MGM China, Sony and QBE. Have a good weekend and Australia Day! Next PostNext How low can the dollar go?